Even in the tranquility of hindsight, Mike Brewer cannot hide a stunned shudder of stupefaction at the epic contradictions that befell him and partner Tom Shipley in the immediate aftermath of the release of their signature single "One Toke Over The Line" in 1971. Returning from a mini-vacation in the Florida Everglades, they discovered that "the Vice President, Spiro T. Agnew, had named us personally as subversive to American youth," Mike recalls. "At exactly the same time, Lawrence Welk performed "One Toke Over The Line", on his TV show, introducing it as a gospel song." Of such absurd quiddities were the legends of the era forged; careers, images, reputations, entire futures, dipped in the invisible ink of the transitive notoriety. Today, Tom is quick and at pains to add about the creation and content of the song in question; "We were just kidding," he notes. "The ACLU really wanted to contest it and go up against the government, the Nixon administration trying to clamp down on the media. All these folkies trying to get us to go to the wall. We were just kidding," he reiterates. All in all the duo much prefers "Song From Platte River" or "Tarkio Road," from this their second and best-selling Kama Sutra album. "Tarkio Road," in fact, is itself rife with the local color and implications drawn from a most divisive, unsettling era. "There was a town in Missouri called Tarkio where we used to play, up in the northwest corner of the state," Mike explains. "We played a lot of colleges in Iowa, Nebraska and Kansas and it seems like whenever we had to play one of those colleges we had to take this highway that we wound up calling Tarkio Road." Tom picks up the narrative, "We'd just come back from living in California, so essentially we glowed in the dark. We had the long hair, and they weren't used to seeing a lot of long hair. We were just a couple of hippies, in the heartland. Some of the folks could be rather nasty. Tarkio Road - we'd drive it at night; we'd be trying to get out of Nebraska, back to Kansas City, it took exactly one tank of gas to get from Tarkio to St. Joe. The good news was you could usually make it, slipping into the gas station on fumes. The bad news was the gas station was a truck stop, and the guys there wanted to take you apart." There is a curious blindness to nostalgia, one that remembers only the fragrant essence of a season, a year, an era, and forgets the Nixons and Agnews bestalking the headlines, and all the other assorted behemoths lurking in the unguarded waystations of the night. 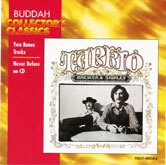 Listening to Tarkio evokes such a fragrance, its tunes summoning the essence of 70's folk/rock. Rootsy and rustic, though it may be, the album is anything but an all-acoustic daydream. Produced by itinerant Chicago blues maven, Nick Graventies, it featured stellar supporting cast of his more notorious associates. "Essentially," Tom recounts, "it was the Butterfield Blues Band. There was Mark Naftalin on piano, Mike Bloomfield on guitar; all these heavy R&B guys and folkies, Mike and Tom. Jerry Garcia played on one track, 'Hey Mommy (I Don't Wanna Be A Commie.' Spencer Dryden from the Airplane was there and Nicky Hopkins who played with the Stones. But that's how our sound developed, through those heavy duty, amps-up-to-eleven guys having to play folk music. It really cracks me up, because people these days will say you should go back to your acoustic roots like you did on Tarkio." That people still approach them at all is something of a revelation to the post-folk scare survivors. "We'll get kids coming up to us in the grunge rock alternative clothes who found our records in the cut-out bins," says Tom. "I'm starting to feel like the endangered otter." Endangered, if not otterish, as their music and their continued existence may seem to some outside their Missouri homebase, both Brewer and Shipley have managed to keep creatively productive. Brewer released a solo album on Full Moon, entitled Beauty Lies, produced by Dan Fogelberg. Shipley segued into TV, producing the prize-winning documentary Treehouse: An Ozark Story. In fact, Brewer and Shipley reunited several years ago to write its soundtrack and have been touring and recording ever since. "We seem to have a feel for soundtracks," Tom says. "Being folksingers, doing documentaries about folk subjects enables us to actually write some real folk songs." Nevertheless, he is aware of the legacy and chalice they carry, laden with the fragrance of long ago. "We were playing the Catskills a few years ago," he recalls, "and this beautiful girl comes gliding across the floor, just glowing. She comes up to Michael and takes his hand and clutches it toward her chest. 'You guys,' she says, 'are the last of the hippies. When you're gone there won't be any more.'" Which at that point would make it a perfect subject for a documentary.